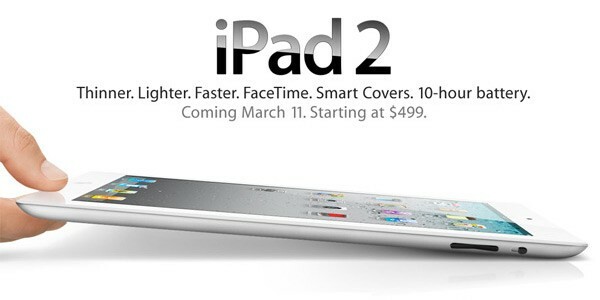 As many of you may know by now, earlier today Apple confirmed the rising swell of rumors by releasing the iPad 2. Apple boasts that it’s “Thinner. Lighter. Faster.” on its website, but what exactly makes this version of the iPad different from the original iPad model? Well, there are a few major changes that make this new iPad stand out as the best tablet computer on the market. First, Apple made a new chip specifically for the iPad 2 that they call the A5. This chip has duel-core processors, which translates to double the speed of the first iPad, and 9 times the graphics speed. This allows for amazing games and faster-loading apps. The new chip plus an LED-backlit display translates to amazing graphics for all of your games and movies on the iPad 2, and absolutely no lag, even in graphic intensive games like Infinity Blade, opening the App Store up to even more graphic intensive games than ever possible before. Apple once again revolutionized the market, creating not only the first tablet with a duel-core processor, but also the most beautiful. Apple also made the iPad 2 33% thinner than the original iPad. This makes it much more portable than the original, and .2 pounds lighter. Reading ebooks at the beach or taking an all-in-one travel companion with you has never been easier! One of the most expected updates for the iPad 2 was rear and forward-facing cameras, with FaceTime support built in, and Apple didn’t disappoint. With the new 4.3 software update, not only will FaceTime be added, but PhotoBooth, the iPad equivalent of the Mac app, and iMovie for iPad, which allows you to edit the HD videos you take with your iPad camera, will also be added. 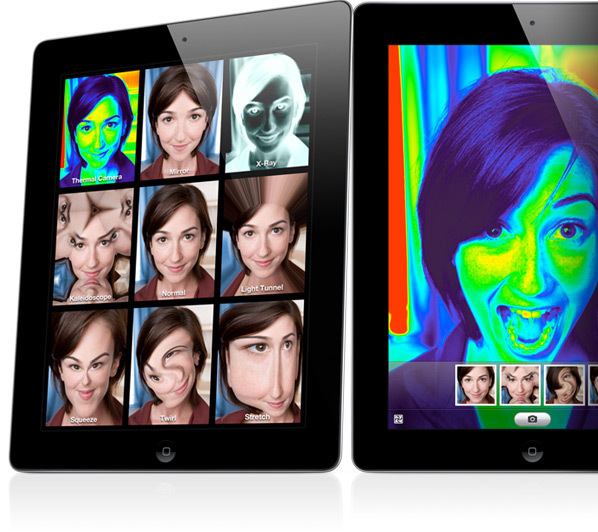 PhotoBooth looks almost identical to the Mac version, with the same effects that make this app so fun to play with. Another important update for the iPad 2 is the addition of a gyroscope. This allows the iPad to better track its movement, making games that rely on the accelerometer more accurate and allowing for increased screen-rotation accuracy. If you own the original iPad, you know that it can sometimes be frustrating to lift your iPad up to reorient it when you changed its orientation on a stand, but the gyroscope on the iPad 2 fixes this problem. Apple also announced its own accessory for the iPad 2, dubbed the Smart Cover, that magnetically attaches to the iPad, acting as a cover, stand, screen cleaner, and screen protector, all in one. When the cover is rolled up, it acts as a stand, both in landscape and portrait, while rolled down it covers and protects the iPad screen. The microfiber lining on the inside of the case cleans your screen when you put it on, and the iPad 2 detects when you are rolling the case on and off and responds by waking itself up. The smart cover comes in polyurethane and leather in a variety of colors. The iPad 2 starts at $499, with the same pricing model for the original iPad. The 3G model will offer a choice between AT&T or Verizon. Smart Covers are sold separately.